An advanced, feature laden, stereo overdrive and distortion pedal with a broad range of options and controls. 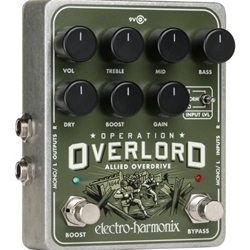 With the Operation Overlordâ€” whether you play keyboards, guitar, bass or pretty much any electronic instrumentâ€”dialing in great drive sounds is fast and foolproof. Active Treble, Mid and Bass controls, a footswitchable Boost mode and a dry blend deliver superlative sound shaping. It even features two independent channels for use with stereo setups. Whatever your rig, the Overlord is your indispensible ally.